Kent Carroll pastors First Institutional Missionary Baptist Church in Tallahassee, Florida.This blog is intended to promote Biblical truth and to give you, the reader, a glimpse of the personal spiritual journey of a pastor-teacher. The content is meant to edify the reader and bring glory to God. a. Realize you cannot forgive without God’s help. b. Forgive others as an act of your will, not as a reaction of your feelings. 1) FACT – You are commanded by God to forgive. So, the question, “Should I forgive”, is irrelevant. 2) FAITH – My faith to forgive is based on His commandment to forgive, not a feeling. God will give you the strength. Forgiveness is done as an act of your will. 3) FEELING – Once you make the decision to forgive by faith, then your feelings will follow. c. Do not base your forgiving on the attitude of the wrongdoer or offender. d. Remind yourself of your own need of forgiveness. Rom 5:6-8 For when we were yet without strength, in due time Christ died for the ungodly. For scarcely for a righteous man will one die: yet peradventure for a good man some would even dare to die. But God commendeth his love toward us, in that, while we were yet sinners, Christ died for us. e. Go to the Great Forgiver and release the wrongdoer in prayer. Father, I come to you in the name of Jesus. I thank you for the forgiveness you have extended to me because of Christ’s shed blood. I realize my continued need of forgiveness as a believer, because of my own sin and many shortcomings. I also realize that I would be sinning against You if I refuse to forgive others who have sinned against me. Therefore, in obedience to You and by an act of my own will and not my feelings, I forgive ___________ . I release them from my self-made prison. I have no right to get even; for all vengeance belong to You. I thank you Lord for giving me the power to forgive them in Jesus’ name, Amen. Many are surprised to know that pastors struggle to maintain prayer as a priority in their lives. In his blog, Tim Challies gives a quote from David M'Intyre in his book, The Hidden Life of Prayer. In the book he says prayer, "In its nature it is a laborious undertaking, and in our endeavor to maintain the spirit of prayer we are called to wrestle against principalities and powers of darkness." Read more. 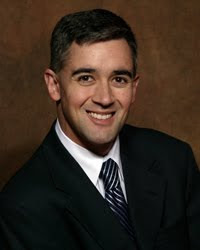 Paul Washer is director of the HeartCry Missionary Society. He is a dynamic preacher of the Gospel. He preaches a powerful and compeling message on the assurance of salvation, the dangers of easy believing and the necessity of repentance in salvation. I came across this sermon on youtube. It is rather long, but worth every second of your time. SPIRIT-FILLED - Acts 4:31 - Only Spirit-filled saints can pray Spirit-filled prayers. SCRIPTURAL - Acts 4:24-28 - Their praying was according to the revealed truth they knew from the writings of the Old Testament and from the revelation they had received from the mouths of the Apostles. 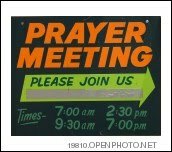 Oh, how I long for a church that will pray like this! HAVE YOU EVER SEEN A ONE-SIDED COIN? The Christian life is described in Scripture as a walk of faith (II Cor. 5:7). Just as there are two sides to a coin, there are two sides to the walk of faith. On one side of our walk of faith there is comfort and ease. One this side, God seemingly answers our prayers rather quickly and we flow in almost uninterrupted victory. On the other side of faith (the coin) there is suffering, trials, tribulations, persecutions, disappointments and sometimes flat out misery. If the truth be told, this is the side of faith that molds and fashions us into the kind of persons God what have us to be. Faith doesn't always know where its going, it trusts the One who is leading. Faith doesn't demand an explanation, it merely summons the grace and strength to endure. Faith is not a blind leap into the dark, it is a deliberate step into the hands of a loving God with our eyes wide open. Faith is not praying and getting from God what I asked for, it is praying and rejoicing over what He has chosen for me. Faith is not a chance, but a certainty. Faith is not a guessing, but a knowing. Faith is not a mere contentment with human misery, it is a calming satisfaction in glorifying God. Just as there is no one-sided coin, there is no one-sided walk of faith. Each aspect of our walk with Him is sovereignly decreed - the smooth, the rough and all that is in-between. In January of this year, I attended a Winter Bible Conference at Grace Church of Tallahassee. The featured speaker for the conference was an evangelist named, Justin Peters. During the four day conference, Justin conducted a seminar titled, A Call For Discernment: A Biblical Critique of the Word of Faith Movement (Health and Wealth Gospel). As a former Word of Faith adherent, I know first hand how the so-called prosperity gospel has wreaked havoc in the Church and has shipwrecked the faith of many. Justin pulls no punches in his critque of the Word of Faith movement. He discusses its metaphysical, cultic origins, its dangerous doctrines and outlandish manifestations. Most importantly, Justin concludes that the Word of Faith movement preaches a distorted view of the God-head and our Lord Jesus Christ. Furthermore, if they preach a different Jesus, then they preach a different Gospel; if they preach a different Gospel, then there can be no salvation. The Word of Faith/Prosperity Gospel has run rampant in the Church, especially over the last 30 to 40 years. Spiritual discernment is at an all time low. I highly recommend Justin Peters' ministry to any church or Christian organization. Unless you have been living in an igloo, by now you have heard about the marital indiscretions of famed golfer, Tiger Woods. I did not use the term "alleged" since Woods has admitted to marital "transgressions" and "personal failings" in an apology letter on his official website. However, you may not have heard about a bit of unsolicited advise given to Tiger Woods by news journalist and former Fox News anchor, Brit Hume. Hume, in a bold, cut to the chase fashion urged Tiger to accept the "forgiveness and redemption offered by the Christian faith." For this advise, Hume has been vilified and ridiculed. MSNBC's, David Shuster, called Hume's advise, "embarassing." Hume was lampooned and caricatured by Jon Stewart on The Daily Show. Additionally, he has been accused of proselytizing and disrespecting the Buddhist faith - the purported religion of Tiger Woods. If Tiger is a Buddhist or follows some other religion, he needs the forgiveness of Jesus Christ. Yes, salvation comes only through Jesus Christ. To say or imply this will always invite the wrath of those who are enemies of the Cross. Brit Hume did what any true Christian (assuming he is one) should do - point a sinner to Jesus Christ and Him alone. We must never kowtow to the pressure of putting Christianity on an equal plane with other religions. The real crisis for Tiger Woods is not salvaging his marriage and career (though his marriage is immensely important.) The real crisis for him is the condition of his soul. A soul without the forgiveness of Jesus Christ will face eternal damnation and separation from God. Tiger Woods, just like all of us, needs a foreign rightousness that is outside of himself - an extraneous rightousness imputed to him by God through Christ. This is the most important advise you can ever give a sinner. Brit Hume or any other Christian will pay a price for daring to do so. Tiger Woods will pay an infinitely higher price if he rejects it. This is no doubt the most important piece of unsolicited advise he will ever hear. I pray that Tiger accepts it. I am married to a very beautiful woman named, Alesia. We have four wonderful children. I pastor First Institutional Missionary Baptist Church in Tallahassee, Florida.